Reprimand to Neelu Vyas came two weeks after she filed a harassment charge against a senior Rajya Sabha official. New Delhi: A question by a Rajya Sabha TV anchor to a studio guest about Atal Bihari Vajpayee’s 1942 undertaking that he would not participate in any anti-British movement so angered Vice President Venkaiah Naidu that the channel was forced to run an apology while the anchor herself was issued a reprimand and taken off air. One month later, the anchor, Neelu Vyas, a veteran who is third in the channel’s hierarchy, remains benched. The relevant clip was also excised from RSTV’s YouTube channel so that it does not show up in internet searches. If the action against Vyas is a reminder of the politically fraught circumstances under which journalists at the parliamentary channel have been working since Naidu became vice president, the fact that the unprecedented reprimand came barely two weeks after she had complained about a senior RS official repeatedly messaging her and interfering with her work and also making “sexually coloured remarks” has also made present and past employees see red. The channel is “owned” by the upper house of parliament and answerable to Naidu but has an editor-in-chief and CEO who are responsible for its day-to-day functioning. Rajya Sabha secretariat officials are not meant to interfere in editorial matters. In an office memorandum dated August 22, 2018, RSTV editor-in-chief Rahul Mahajan accused Neelu Vyas of having raised an “unsubstantiated allegation” against the former prime minister, who passed away on August 16. “At the time when Shri Atal Bihari Vajpayee was on his deathbed, out of context reference was made by you,” the memo states. “Because of your ungraded approach (sic) while anchoring on such an important issue, RSTV has faced embarrassment and had to apologies (sic). Vyas was asked to submit an explanation within seven days. She was also told verbally that she would be taken off anchoring for two weeks. That period is still continuing. Memo addressed by RSTV editor Rahul Mahajan to anchor Neelu Vyas. The discussion in question occurred on August 16. Vajpayee’s death was believed to be imminent and the national broadcaster, Doordarshan, had prematurely declared that he had indeed passed away. 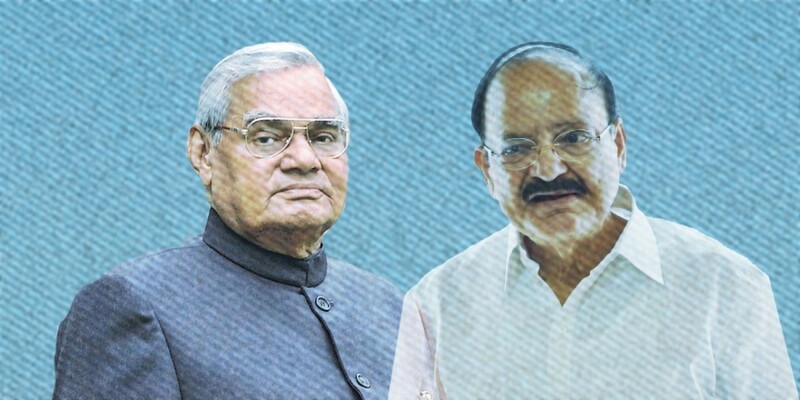 Virtually all news channels, including RSTV, devoted the bulk of their programming that day to discussions about Vajpayee’s life with guests and anchors going into the minutiae of his political career. Far from treating the question as an “unsubstantiated allegation” – as RSTV’s editor described it in his note reprimanding the anchor – Trivedi said the incident in which the young Vajpayee was arrested and had then signed on an undertaking to not oppose the British did indeed take place. Trivedi added that there was no question of Vajpayee reconciling what happened then with his later life. “He never denied it, or confirmed it, or spoke about it but this does not mean anyone can question his nationalist character”. The studio discussion then carried on over into aspects of Vajpayee’s life and nothing more was said about the 1942 issue on air or off until four days later when a Hindi language website ran a story on how the anchor’s question had upset the BJP and RSS. Soon after, A.A. Rao, an additional secretary in the Rajya Sabha secretariat and a bureaucrat considered close to Vice President Naidu demanded that the channel take action. WhatsApp message sent to RSTV editor-in-chief Rahul Mahajan and widely shared within the organisation. According to RS secretariat sources, Naidu ordered the channel issue an apology when the matter was brought to his notice. It was soon after this that Mahajan issued his memo demanding an explanation from Neelu Vyas. Mahajan and Vyas both declined to comment on the apology but A.A. Rao confirmed to The Wire that he had communicated his objections to RSTV’s editor-in-chief. Asked what was factually inaccurate about the anchor’s question, Rao said the context was everything, suggesting that it was inappropriate to have raised the issue that day when Vajpayee was on his death bed. 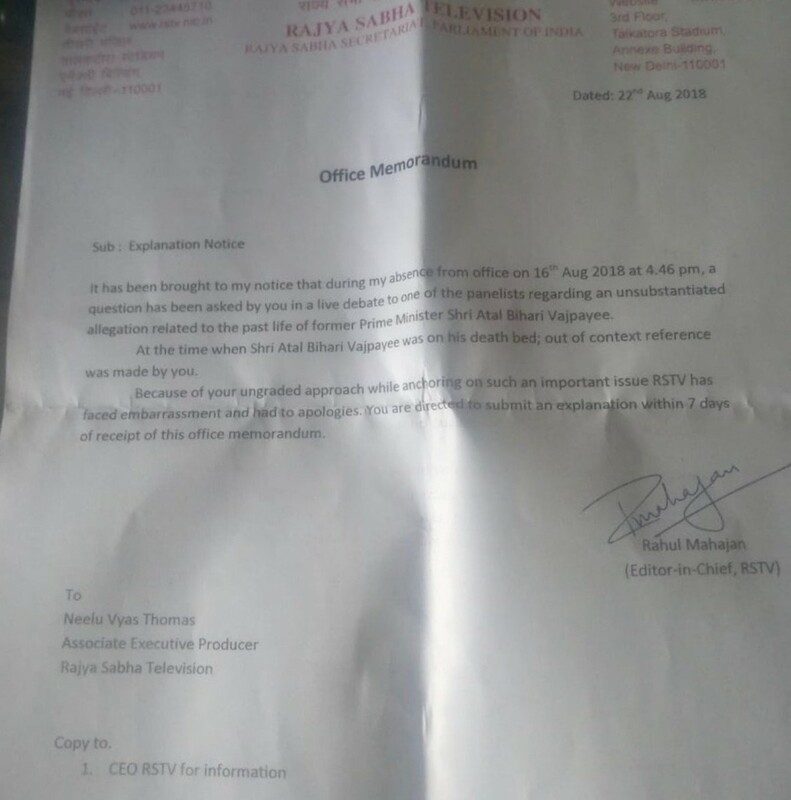 Present and former RSTV employees question the role played by A.A. Rao in escalating the issue within the channel given the fact that Neelu Vyas had filed a complaint on August 8, accusing Rao of harassment and interference, and of making a “sexually coloured” remark. The Rajya Sabha secretariat’s secretary, P.P.K. Ramacharyulu, told The Wire that the complaint was being handled “as per procedure” but declined to confirm whether it had been referred to the secretariat’s internal complaints committee.